Rodents are members of the order Rodentia, which is the largest order of mammals. Rodents are mostly distinguished by their teeth—the word "rodent" comes from the Latin word rodere, meaning "to gnaw." There are about 1,500 species of rodents including mice, rats, squirrels, and beavers (Nowak, 1983; UCMP, 2007). They are found on all continents except Antarctica and in almost all land habitats, from tropical forests to deserts to mountains to tundras. Rodents and bats are the only orders of placental mammals with species native to Australia. While some rodents have a reputation as agricultural pests or vectors of disease, rodents in general provide significant ecological, dietary, aesthetic, and scientific values. In many habitats, they are very abundant, and thus are important in food webs and in dispersal of plant seeds. Some species have provided food and fur to human beings, and the trapping of beavers for fur was historically important in North America. Laboratory rats, mice, and guinea pigs have contributed greatly as model organisms in scientific research. Rabbits, hares, and pikas are not rodents, but members of another order, Lagomorpha. The incisor teeth of rodents are their most distinctive feature. 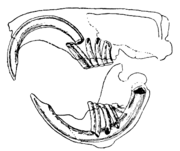 A rodent's incisors grow continuously throughout its life and must be kept worn down by gnawing. The incisors of a pocket gopher can grow 20 inches in one year. The incisors have enamel on the outside and exposed dentine on the inside, so they self-sharpen during gnawing. Rodents lack canines and first premolars, which creates a space between their incisors and their grinding teeth. Most rodents are small; the tiny African pygmy mouse (Mus minutoides) is one of the smallest rodents at only 2.5 inches (6 cm) long and weighing only .25 oz (7 grams). The largest living rodent, the capybara (Hydrochoerus hydrochaeris), can weigh up to one hundred pounds (45 kg) and the extinct Phoberomys pattersoni is believed to have weighed up to 1,500 pounds (700 kg). Most rodents mature quickly and soon produce offspring. A female meadow mouse (Microyus pennsyvanicus) can have up to 17 litters of 4 to 13 young in a year. Many rodents have an average life span of only a year or less, although some larger rodents such as beavers and porcupines can live over 20 years. 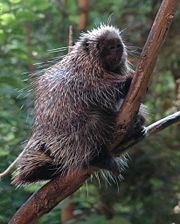 The oldest recorded rodent was a Sumatran Crested Porcupine (Hystrix brachyura) that lived 27 years and three months (Voelker, 1986). Most rodents eat plants, including seeds, fruit, grasses, and leaves, as well as the bark of trees. Some rodents prey on insects and other small animals. The fish-eating rats (Ichthyomys species) of South America (and some others) swim in streams to catch small fish. The naked mole rat (Heterocephalus glaber) spends its entire life underground. Flying squirrels live their lives in trees and glide, not truly fly, between trees to avoid spending time on the ground. Many rodents living in colder climates hibernate to conserve energy during the winter. Some squirrels help maintain and spread forests by burying the seeds of trees. The seeds of the Brazil nut tree will not germinate unless they are first gnawed open and buried by an agouti (Dasyprocta species) (Attenborough, 2002). 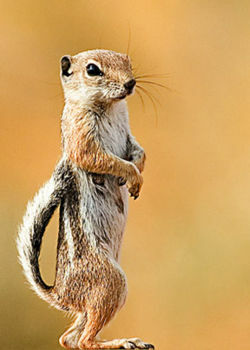 Gophers, ground hogs, prairie dogs, and other burrowing rodents enrich the soil by mixing it and by burying vegetation. Beavers (Castor species) help control flooding and create pond and meadow habitats with their dam building, which benefits many other species,. 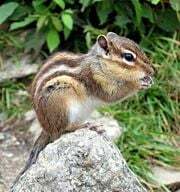 Rodents are often the most abundant small vertebrates in their habitats and are an important source of food for many other animals, including birds, reptiles, and other mammals. If their numbers were not kept in check by predators, rodents would soon over run their environments. Norwegian lemmings (Lemmus lemmus), and some other rodents, undergo "population explosions" every few years. This is thought to help them expand their range into new areas. From earliest times, rodents have been eaten by humans. Although the flesh of all species is edible, rodents are not an important food source in the world today. Among the exceptions are the capybara and the guinea pig (Cavia porcellus) of South America and the bandicoot rat (Bandicota bengalensis) of Southeast Asia. The dormouse (Glis glis) was considered a delicacy in ancient Rome and is still eaten in parts of Europe today. In North America, squirrels, groundhogs, muskrats, and porcupines are sometimes eaten. The fur of some rodents is an important product. The trapping of beavers for their fur played an important part in the history of North America. Some other rodents are also trapped for fur in the wild, while the chinchilla (Chinchilla laniger) of South America is raised for its fur. The greatest impact of rodents on humans began when agriculture started and people chose to live in settled homes. At that time, some rodent species moved into human dwellings, especially to eat stored grain and food scraps and to benefit from warm living spaces and protection from predators. The house mouse (Mus musculus), which seems to be native from the Mediterranean area to China, and several species of rats (Rattus species), native to Southeast Asia, were the most successful and now live with humans all over the world. Although the great majority of rodent species do no harm to humans, these commensal (which means "sharing the same table") species, especially rats, do a tremendous amount of damage to crops and stored food. They also spread diseases, including the bubonic plague, that have killed tens of millions of people through history and are still a danger today. Rats also do a lot of damage to the environments that they have been introduced to by humans. The black rat (Rattus rattus), also known as the ship rat, was carried around the world on sailing ships and has contributed to the extinction of many species of birds and other animals, especially on remote islands (ISSG, 2007). Many wild rodent species and subspecies are now endangered because of habitat loss and introduction of invasive species, including rats (IUCN, 2007). Some species of rodents are kept as pets. One of the most popular rodent pets is the golden hamster (Mesocricetus auratus). All of the world's pet golden hamsters are considered to be descendants of one family captured in Syria in 1930 (Voelker, 1986). Other rodent pets include mice, rats, and guinea pigs. Rodents also play an important role as subjects of scientific research. One reason for this is that with their short lives many generations can be studied in a few years. Research on mice, rats, and guinea pigs has contributed greatly to our understanding of biological processes and has helped to save millions of human lives. Rodents are part of the clades Glires (along with lagomorphs), Euarchontoglires (along with lagomorphs, primates, treeshrews, and colugos), and Boreoeutheria (along with most other placental mammals). The order Rodentia is classified below to the level of families. Invasive Species Specialist Group (ISSG). Rattus rattus (mammal). Retrieved September 28, 2007. IUCN Species Survival Commission (IUCN). 2007 ICUN Red List of Threatened Species. Retrieved September 28, 2007. University of California Museum of Paleontology (UCMP). Introduction to the Rodentia. Retrieved September 28, 2007. This page was last modified on 4 April 2008, at 00:37.